Paid sick days enable workers to take a minimum number of paid days off from their employer to recover from a routine or short-term illness or care for a sick family member without risking being fired or losing pay. Laws providing for paid sick days have been enacted in four states and at least 18 cities in the United States as of June 22, 2015, most of them passed since 2012. Before recent wins, through which more than 9.5 million workers will newly have access to paid sick days, about 43 million or one third of U.S. workers lacked access to paid sick days in 2014, concentrated in low-wage work and service industry jobs, according to the Bureau of Labor Statistics. Close to eight in ten food service workers do not earn paid sick days. A coalition of corporate lobbying groups like the National Restaurant Association (NRA) have lobbied and campaigned against the expansion of paid sick days, and the American Legislative Exchange Council (ALEC) and ALEC politicians have played key roles in blocking local paid sick days laws by using a strategy of preemption that strips local governments of their authority to act. This concerted effort to stop local laws they disagree with and strip local governments of their power is an organized national strategy promoted by ALEC and their corporate allies who find it more efficient to influence laws made in the state capital than to fight higher standards in city after city. A coalition of corporate lobbying groups including the National Federation of Independent Business, the National Restaurant Association, and the American Hotel and Lodging Association, which have long opposed paid sick days, recently started pushing preemption bills in many states. The preemption strategy may be a "faster, cheaper alternative" to fighting ballot referenda, according to Mother Jones. The Center for Media and Democracy, publisher of SourceWatch, exposed how this preemption strategy was discussed at a recent ALEC meeting in its article, "The ALEC-Backed War on Local Democracy." Paid sick days should not be confused with family and medical leave, which generally does not include routine illness or preventive health appointments. See Paid Sick Days Laws in the United States for more information. 5 Paid Sick Days Campaigns and Laws in the U.S.
Corporate-backed state interference laws known as preemption bills prohibiting paid sick days have passed at the state level in Wisconsin, Louisiana, Mississippi, and other states that would override or preempt (or, as one GOP operative put it, "deliver the kill shot" to) local laws requiring paid sick days. This paid sick day preemption effort can be traced back to Wisconsin Governor Scott Walker and the American Legislative Exchange Council (ALEC), as the Center for Media and Democracy (CMD) first reported in 2013. Walker pushed Senate Bill 23 to override a Milwaukee ordinance providing for paid sick days in May of 2011. This appears to have been the first paid sick days preemption bill passed in the country. Milwaukee's ordinance had passed via referendum with nearly 70 percent of the popular vote in 2008. The bill was brought to the Labor and Business Regulation Subcommittee of the ALEC Commerce, Insurance and Economic Development Task Force at ALEC's August 2011 Annual Meeting in New Orleans a few months later. Meeting attendees were given complete copies of Wisconsin's 2011 Senate Bill 23 (now Wisconsin Act 16) as a model for state override. ALEC's Labor and Business Regulation Subcommittee was co-chaired by YUM! Brands, Inc. -- which owns Kentucky Fried Chicken, Pizza Hut, and Taco Bell -- at the time. Legislators attending the subcommittee meeting were also given a target list and a map of state and local paid sick day policies prepared the National Restaurant Association (NRA), an ELC member. The Wisconsin state chapter of the NRA lobbied for Senate Bill 23 to repeal Milwaukee's sick days ordinance, as did the local branch of the U.S. Chamber of Commerce, also an ALEC member. A similar pattern of opposition has emerged across the country. As cities like Seattle, Portland, and Philadelphia have taken up paid sick day laws, the state and local chapters of the NRA and the U.S. Chamber of Commerce have lined up against it. Other consistent paid sick day opponents include the National Federation of Independent Business (NFIB) and Darden -- the parent company of Olive Garden, Capital Grille, and other restaurant chains. Darden was previously an ALEC member and has had a representative on ALEC's corporate board, but cut ties with ALEC in January 2010 after deciding "to allocate resources and time to organizations that would serve us best . . . like the National Restaurant Association," according to a company spokesperson. A coalition of corporate lobbying groups including the National Federation of Independent Business, the National Restaurant Association, and the American Hotel and Lodging Association that has long opposed paid sick days recently started pushing preemption bills in many states. The preemption strategy may be a "faster, cheaper alternative" to fighting ballot referenda, according to Mother Jones. The campaign has also included close monitoring of minimum wage protests and labor activists, according to documents obtained by Salon. In 2015, David Koch's astroturf group Americans for Prosperity fought paid sick days in New Brunswick New Jersey with a series of press releases. “The members of the council may be well-intentioned, but the reality is mandating paid sick time will do far more harm than good for the residents and businesses within the City of New Brunswick,” stated AFP Communications Director Mike Proto. 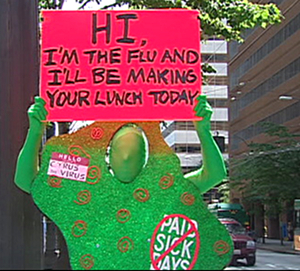 The business groups fighting paid sick days appear to make use of front groups, organizations created in order to disguise the identities of their backers. For example, representatives of the National Restaurant Association have been known to cite studies by the Employment Policies Institute (EPI), one of the many front groups created by and housed in the office of the PR firm Berman & Co. The EPI "has no employees of its own," shares the same office as Berman's PR firm, and funnels money to the PR firm, as The New York Times reported in a 2014 front page story. In another example, Worker Center Watch -- a group that has targeted workers' centers like ROC United and OUR Walmart -- has close ties to Joseph Kefauver, whose PR firm registered its website, as reported by The Nation, and who is also on the board of another Berman front group, the Center for Consumer Freedom (renamed the Center for Organizational Research and Education). Kefauver has worked as a consultant for the National Restaurant Association and formerly worked for Darden's political action committee and in public affairs at Walmart. The U.S. government does not have any national law requiring paid sick days nationwide as of 2015. Companies that fall under the Family and Medical Leave Act (FMLA) are required to provide "up to 12 weeks of unpaid leave for certain medical situations for either the employee or a member of the employee's immediate family." That law applies only to firms of 50 or more; employees must have been on the job for at least a year and work at least 1250 hours a year to qualify. The FMLA generally does not include routine illness or preventive health appointments, and by being unpaid is hard even for those who are eligible. President Barack Obama called for a national paid sick days policy in his 2015 State of the Union Address, saying, "Send me a bill that gives every worker in America the opportunity to earn seven days of paid sick leave. It's the right thing to do." Workers without paid sick days are one-and-a-half times more likely to go to work with a contagious illness. Productivity lost due to health issues costs businesses an estimated $225.8 billion per year. Such workers also pose substantial risks to public health. For example, "gaps in paid sick leave result in severe impacts on public health and the economy as recent studies on H1N1 confirmed: In 2009, when the economic crisis and the H1N1 pandemic occurred simultaneously, an alarming number of employees without the possibility of taking paid sick days attended work while being sick. This allowed H1N1 to spread into the workplace causing infections of some 7 million co-workers in the USA alone," according to the World Health Organization. An estimated 12,469 deaths occurred in the U.S. in 2009 as a result of H1N1. Another study shared by the U.S. Centers for Disease Control found that close to 12 percent of food service workers reported coming to work while experiencing vomiting or diarrhea, but those who had paid sick days were half as likely to have done so. Accessed to paid sick days is unevenly distributed in the workforce. Low-wage workers, retail and food service workers, and part-time workers are significantly less likely to have access to paid sick days. Rural workers are less likely than urban and suburban workers, according to a University of New Hampshire study, suggesting that blocking statewide paid sick days disproportionately harms rural Americans. 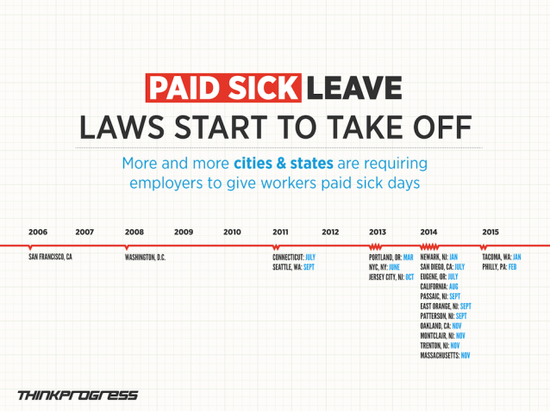 Paid Sick Days Campaigns and Laws in the U.S. Healthy Families Act: Legislation first introduced in 2004 that would set a national standard for workers to earn up to seven paid sick days per year. California: California passed the "Healthy Workplaces/Healthy Families" Act in 2014, which allows employees to accrue paid sick days at a minimum rate of one hour per thirty hours worked. Connecticut: In July 2011, Connecticut passed a paid sick days law that requires employers to allow workers to accrue at least one hour of benefits per forty hours worked. Massachusetts: Voters in Massachusetts passed a law in November 2014 requiring employers to provide paid sick days, accrued at a rate of one hour per thirty hours worked. Oregon: Oregon became the fourth state in the U.S. to require paid sick days for most workers after the state legislature passed a law in June 2015 that "requires employers with 10 or more workers to pay for time off due to illness, mandating up to five days off for full-time workers, and allows the use of paid sick leave to care for ill family members," according to Reuters. Vermont: The Vermont legislature passed a bill to require paid sick days for most workers in February 2016, making Vermont the fifth state to have a paid sick days requirement. The legislation provides for each worker to have three paid sick days in 2017 and 2018, rising to five paid sick days in 2019, with exemptions for workers under 18, those working less than half time, and certain types of job. San Francisco, CA (2007): San Francisco was the first city in the United States to pass a paid sick days ordinance, which allows all workers (including temporary and part-time workers) to earn one hour of paid sick leave per 30 hours worked. Leave can be used for the worker's own medical care or to care for a family member or "other designated person." It came into effect in 2007. A study of the policy's early impacts published in the American Journal of Public Health found that, by 2009, 99 percent of large businesses and 86 percent of small businesses offered paid sick days, with a greater proportion of low-wage firms (such as food- and accommodations-industry businesses) having to make major changes to or adopt new policies. Of the businesses that did make major changes, about a third reported a decline in profitability and about 18 percent reported higher prices, but 17 percent reported higher morale among employees, and 71 percent of firms overall approved of the policy. Another study found that business had grown in San Francisco compared to neighboring counties, including among small businesses and in the retail and food sectors. Washington, D.C. (2008): Washington, D.C. passed the Accrued Sick and Safe Leave Act in 2008. The law included exemptions for certain classes of workers such as healthcare workers and students working part-time. A 2013 report by the D.C. auditor found that the law had increased access to paid sick days, with 68 percent of employers offering it compared to only half prior to the law. 87.5 percent of business respondents said that the law would not force them to move their businesses. According to the auditor's report, "According to District businesses owners interviewed by the Auditor, the paid sick leave requirement of the Act did not discourage owners from establishing businesses in the District. Additionally, the business owners stated that the policy requirement of the Act did not encourage owners to move their businesses from the District." Milwaukee, WI (2008) (passed, then blocked by state legislature): Voters in Milwaukee, Wisconsin "overwhelmingly" approved a binding referendum for paid sick days, with 69 percent voting for the measure, in November 2008. According to the Milwaukee Journal-Sentinel, "Proponents waged a grass-roots, door-to-door campaign, distributing more than 200,000 pieces of literature that said no workers should have to lose a job because they are sick or have to care for a sick child." At the time, the president of the Metropolitan Milwaukee Association of Commerce said that opponents would pursue a legal challenge. Seattle (2012): Since 2012, people working for Seattle employers with four or more employees accrue "paid sick and safe time" to use for their own or a family member's illness or safety (such as situations related to domestic violence or sexual assault). A report issued in 2014 by the city auditor and a University of Washington research team found that, while some employers initially feared the new leave requirements would be costly and confusing, after implementation most said that it "had a small to negligible impact on the complexity or sustainability of their operations." The report also offers suggestions to reduce confusion and make implementation easier, such as information outreach to HR staff and a sufficiently long phase-in period. Cities in New Jersey (2013-2016): Twelve New Jersey cities have passed paid sick day ordinances, including Jersey City (October 2013), Newark (January 2014), Passaic, East Orange, Patterson, Irvington, Montclair, Trenton, Bloomfield, Elizabeth (enacted 2015, effective 2016), New Brunswick (enacted 2015, effective 2016), and Plainfield (enacted 2016). Tacoma, WA (2015): Tacoma, Washington passed an ordinance providing for "paid sick and safe leave" for private-sector employees, which would go into effect on February 1, 2016. Leave accrues at a rate of one hour per 40 hours worked up to 24 hours each year, and may be used for workers' own health care, care of a family member, or "reasons related to domestic violence, when their place of business or child’s school/daycare is closed by order of a public official, and for bereavement leave for family members." Pittsburgh, PA (2015, on hold): Pittsburgh's City Council passed a paid sick days ordinance on August 3, 2015. The Pennsylvania Restaurant and Lodging Association and other business groups challenged the ordinance in a lawsuit, and on December 21, 2015 Common Pleas Judge Joseph James struck it down. As of January 2016, it was unknown whether the decision would be appealed. Spokane, WA (2016): The Spokane City Council passed a paid sick days ordinance on January 11, 2016. Chicago, IL (2016): The Chicago City Council unanimously passed a paid sick days ordinance on June 22, 2016, allowing workers to earn up to five days of paid sick time each year; the ordinance will go into effect in July 2017. Main Street Alliance of Minnesota/National Partnership for Women and Families, "The Bottom Line on Earned Sick Time in Minnesota: A Cost and Benefit Analysis of Earned Paid Sick Days," research report, January 2016. Center for Economic and Policy Research/City University of New York, "Good for Business? Connecticut's Paid Sick Leave Law," research report, February 2014. National Partnership for Women and Families, State and Local Action on Paid Sick Days, November 2014. American Public Health Association, "Support for Paid Sick Leave and Family Leave Policies," policy document, 2013. Institute for Women's Policy Research, "San Francisco’s Paid Sick Leave Ordinance: Outcomes for Employers and Employees," research report, February 2011. National Partnership for Women and Families, Paid Sick Days campaign site. World Health Organization, The case for paid sick leave," World Health Report, 2010. ↑ Claire Cain Miller, "New Momentum on Paid Leave, in Business and Politics," The New York Times, June 22, 2015. ↑ Ellen Bravo, "Why the Momentum for Paid Sick Days?," Family Values At Work, November 6, 2015. ↑ U.S. Bureau of Labor Statistics, "Employee Benefits in the United States--March 2014," government publication, March 2014. ↑ 4.0 4.1 U.S. Bureau of Labor Statistics, "Paid Sick Leave in the United States," governmental publication, March 2010, accessed February 16, 2015. ↑ Kathryn Vasel, "Who doesn't get paid sick leave?," CNN, January 20, 2015. ↑ Brendan Fischer, "Embattled ALEC, Buoyed by Election Results, Lays Blueprint for 2015," Center for Media and Democracy, PR Watch, November 17, 2014. ↑ Stephanie Mencimer, "Forced to Work Sick? That's Fine With Disney, Red Lobster, and Their Friends at ALEC," Mother Jones, June 27, 2013. ↑ 8.0 8.1 8.2 8.3 "Coughing Cooks Stay Home as U.S. Cities Require Paid Sick Leave," Bloomberg News, March 22, 2013. ↑ 9.0 9.1 Joshua Holland, "Oklahoma Provides a Win for ALEC’s 50-State Campaign Against Democracy," Moyers & Company, April 18, 2014. ↑ 10.0 10.1 National Restaurant Association, "Cities and states debate paid sick leave," press release, June 25, 2013. ↑ 11.0 11.1 Hannah Levintsova, "Will Your State's Waiters Give You the Flu?," Mother Jones, June 27, 2013. ↑ David Damron, "Latest release of sick-time records lacks crucial texts," Orlando Sentinel, January 2, 2013. ↑ 13.0 13.1 13.2 13.3 13.4 13.5 Brendan Fischer, "Efforts to Deliver 'Kill Shot' to Paid Sick Leave Tied to ALEC," Center for Media and Democracy's PR Watch, April 3, 2013. ↑ Wisconsin State Legislature, Act 16, state law, accessed February 16, 2015. ↑ 15.0 15.1 Georgia Pabst, "Paid sick leave referendum wins big," Milwaukee Journal Sentinel, November 4, 2008. ↑ American Legislative Exchange Council, Labor and Business Regulation Subcommittee meeting agenda, organizational document, August 2011, obtained and archived by CMD. ↑ American Legislative Exchange Council, Commerce, Insurance, and Economic Development Task Force, organizational meeting agenda, obtained and released by the Center for Media and Democracy. ↑ National Restaurant Association, State and Local Paid Sick Leave Mandates, document obtained by CMD, accessed February 16, 2015. ↑ Josh Eidelson, "Exclusive: Private documents reveal how Big Restaurant lobby monitors fast food protests," Salon, May 5, 2014. ↑ Eric Lipton, "Fight Over Minimum Wage Illustrates Web of Industry Ties," New York Times, February 9, 2014. ↑ 21.0 21.1 Lee Fang, "Look Who the Folks Who Took Down ACORN Are Targeting Now," The Nation, May 19, 2014. Accessed February 18, 2015. ↑ Center for Organizational Research and Education, 2013 Form 990, organizational annual IRS filing, November 10, 2014. ↑ U.S. Department of Labor, "Sick Leave," government website, accessed February 17, 2015. ↑ Barack Obama, "State of the Union Address, January 20, 2015, archived by CNN, accessed February 17, 2015. ↑ Walter Stewart et al., "Lost Productive Work Time Costs From Health Conditions in the United States: Results From the American Productivity Audit," Journal of Occupational and Environmental Medicine, Vol. 45, No. 10, 2003, archived by National Partnership for Women and Families, accessed February 17, 2015. ↑ Xenia Scheil-Adlung and Lydia Sandner, "The case for paid sick leave," World Health Survey, 2010, accessed February 18, 2015. ↑ Shrestha, S. S., Swerdlow, D. L. et. al, "Estimating the burden of 2009 pandemic influenza A (H1N1) in the United States (April 2009-April 2010)," Clinical Infectious Diseases, January 2011, archived by National Institutes of Health, accessed February 26, 2015. ↑ Sumner et. al, "Factors Associated with Food Workers Working while Experiencing Vomiting or Diarrhea," Journal of Food Protection, Vol. 74, No. 2, 2011, archived by Centers for Disease Control, accessed February 17, 2015. ↑ Bureau of Labor Statistics, "Leave Benefits," table of government survey data, March 2012, accessed February 18, 2015. ↑ Kristin Smith and Andrew Schaefer, "Rural workers have less access to paid sick days," issue brief, The Carsey School of Public Policy at the Scholars' Repository, University of New Hampshire, 2011, accessed February 17, 2015. ↑ 113th Congress, H.R. 1286 "Healthy Families Act," introduced March 20, 2013, accessed February 25, 2015. ↑ California Division of Labor Standards Enforcement, "Paid Sick Days Poster," government document, accessed May 2015. ↑ Connecticut General Statute, Sick Leave Law, government website, accessed May 2015. ↑ "Massachusetts Passes Paid Sick Leave Law," National Law Review, November 14, 2014. ↑ Courney Sherwood, "Oregon lawmakers pass paid sick leave bill," June 13, 2015. ↑ Alexei Rubenstein, "Paid sick leave set to become law in Vermont," WCAX, February 19, 2016. ↑ Peter Hirschfeld, "Vermont Becomes The Fifth State To Require Paid Sick Leave ," Vermont Public Radio, March 9, 2016. ↑ Kenneth Quinnell, "Vermont Becomes the Fifth State to Require Paid Sick Leave," AFL-CIO NOW, February 23, 2016. ↑ San Francisco Office of Labor Standards Enforcement, "San Francisco Paid Sick Leave Ordinance," government document, accessed February 25, 2015. ↑ Carrie H. Colla, PhD, William H. Dow, PhD, Arindrajit Dube, PhD, and Vicky Lovell, PhD, "Early Effects of the San Francisco Paid Sick Leave Policy," American Journal of Public Health, Vol. 104 No. 12, December 2014. ↑ Zach Beauchamp, "Despite Big Business' Warnings, There's No Evidence That Mandated Sick Leave Causes Job Loss," ThinkProgress, February 14, 2013. Accessed March 19, 2015. ↑ Office of the District of Columbia Auditor, Yolanda Branche, D.C. Auditor, "Audit of the Accrued Sick and Safe Leave Act of 2008," government report, June 19, 2013. ↑ Georgia Pabst, "Walker signs law pre-empting sick day ordinance," Milwaukee Journal-Sentinel, May 5, 2011. ↑ Seattle Office for Civil Rights, "PAID SICK AND SAFE TIME," government website, accessed March 19, 2015. ↑ 45.0 45.1 Jennifer Romich with Wes Bignell, Tracy Brazg, Chantel Johnson, Cori Mar, Jennifer Morton, and Chiho Song, "[Implementation and Early Outcomes of the City of Seattle Paid Sick and Safe Time Ordinance]," report for City of Seattle and City Auditor, April 23, 2014. ↑ Bryce Covert, "Jersey City Mayor Signs Country’s Seventh Paid Sick Days Law," ThinkProgress, October 21, 2013. ↑ Bryce Covert, "Newark Passes The Country’s Eighth Paid Sick Leave Law," ThinkProgress, January 28, 2014. ↑ Stacey Adams and Jessica Agarwal, "The Explosion of Paid Sick Leave In New Jersey," Littler, legal newsfeed, January 23, 2015. ↑ 49.0 49.1 National Partnership for Women and Families, Current Paid Sick Days Laws, National Partnership for Women and Families, December 23, 2015. ↑ Jessica Remo, "Plainfield becomes 12th N.J. city to require paid sick leave," NJ Advance Media, March 16, 2016. ↑ 51.0 51.1 51.2 51.3 51.4 51.5 Bryce Covert, "Philadelphia Joins The Growing Ranks Of Cities Requiring Paid Sick Days," ThinkProgress, February 12, 2015. ↑ Tricia Nadolny, "Council passes mandatory paid sick leave bill," The Philadelphia Enquirer, February 12, 2015. ↑ David S. Kim, Salvador P. Simao, "Philadelphia Enacts Paid Sick Leave Ordinance," Legal Alerts, Ford Harrison, legal newsfeed, February 18, 2015. ↑ Katharine M. Tylee, Davis Write Tremaine LLP, "Tacoma adopts paid sick and safe leave ordinance for 2016," legal newsfeed, Lexology/Association of Corporate Counsel, March 17, 2015. ↑ Bob Bauder, "Pittsburgh City Council approves ordinance requiring paid sick leave," TribLive, August 3, 2015. ↑ Annie Hunt, "Pittsburgh's paid sick leave law ruled unenforceable," Pennsylvania Record, January 13, 2016. ↑ Katie Chen, "Spokane Council mandates paid sick leave for employees," KHQ/NBC, January 12, 2016. ↑ Hal Dardick, "Chicago City Council approves paid sick leave on busy day ," Chicago Tribune, June 24, 2016. 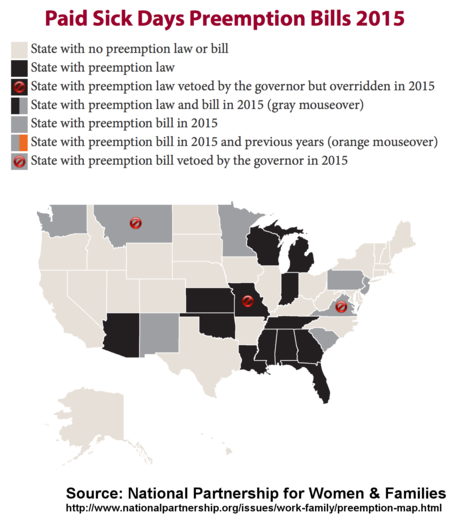 ↑ Grassroots Change, Preemption Map, Grassroots Change, 2016.